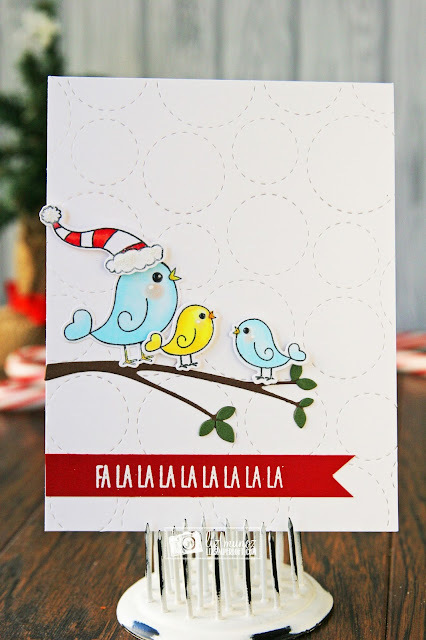 Liz's Paper Loft: MCT 5 Days of Christmas Day 3 ~ fa la la la la la la la la! MCT 5 Days of Christmas Day 3 ~ fa la la la la la la la la! GOOD MORNING my friends! Today is Day 3 of My Creative Time 5 Days of Christmas. This week my Design Team Sisters at My Creative Time are working on a treat this week for our “5 Day s of Christmas”. You will see tons of AMAZING ideas from tags, treats, cards, gift card holders, etc.... to get your holidays off to a “crafty” good start! We all hope you enjoy everything you will see this week! Today I have a sweet card to share with you! This card looks more time consuming that it is. I first die cut the background with the circles, then stamped the birdies with Memento Ink and colored with copic markers. Next I die cut the birds, hat, and branch, then assembled. For the banner I heat embossed the sentiment. Super quick and fun card! OMG Miss Liz What a Super TWEET Card. I just love how you have your birdies all seranading us with their "Fa..la...la..la..la...de..da" they are so cute!! Great coloring job too!! Awesome creative ways you've used Miss Emma's goodies. 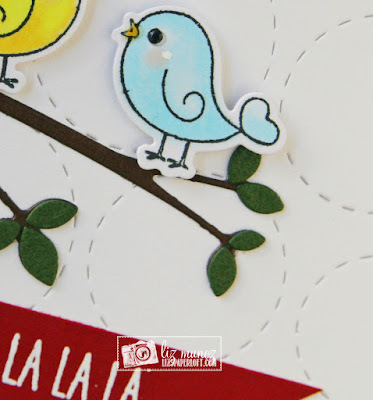 Love the textured background and sweet birds! Darling card! Oh so TWEET! YES! I had to say it! I LOVE that background... simply fantastic! So cute with these singing birds. 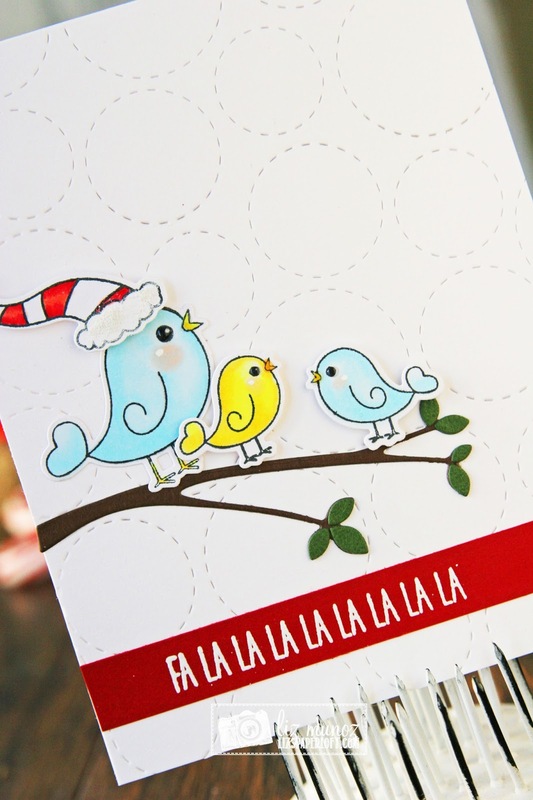 Oh how tweet-dorable is this card, love it! Clever idea to use the tweeting birds. love the fa la lala la so cute!!! What a beautiful card. I love the birds, so adorable! A sweet trio of birds, singing their hearts out! The circles background, while subtle, adds wonderful impact! Oh Ms. Liz, how sweet is this card with the little birds singing. I just love it. Thank you so much for the inspiration. Love this card-the birds are too cute! Love your adorable little birdies. Great background. Sweet card! Love how you have the birds singing the Christmas song! Sweet card and I'm so in love with your awesome background! Your card is adorable...I love these little birds! Wonderful card!